The peanut butter bacon cookies I made recently went over so well with Mark and I was hesitant to do another peanut butter cookie so soon after. He loved the other ones so much that I wasn’t sure how anything else would measure up. These are decidedly different from the other cookies. Because they’re not gluten-free, they’re softer and more chewy. The peanut butter flavor was also more subtle. And, once again, they were a huge hit. Cream the butter, peanut butter and sugars until light. Add the egg and mix until fluffy. Blend the flour, baking powder, soda and salt together well. Add these dry ingredients to the butter mixture. Add the chocolate chips. Drop cookie dough by teaspoonfuls onto lightly greased baking sheets. Bake for 10-12 minutes. They look so soft and chewy, yum! Great job! Those look wonderful! 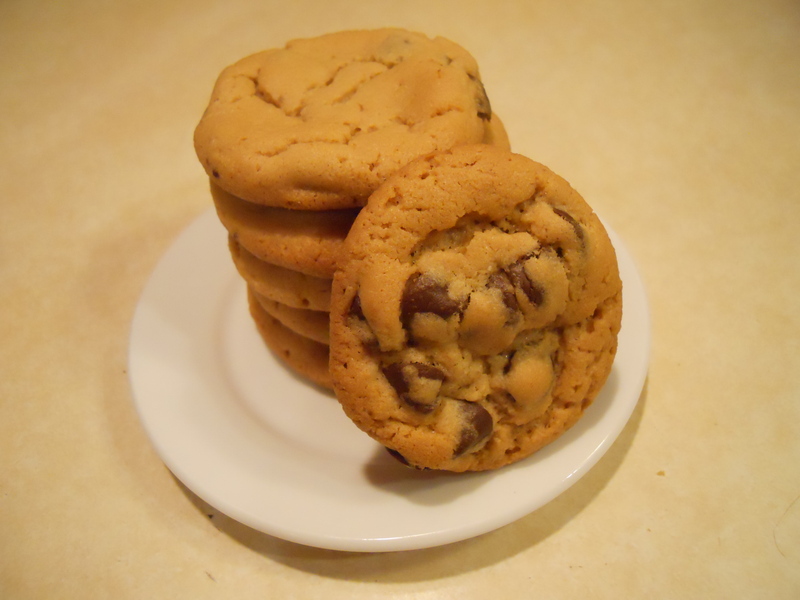 I usually use semi sweet chips in cookies, but I bet the milk chocolate is a nice complement to the peanut butter.